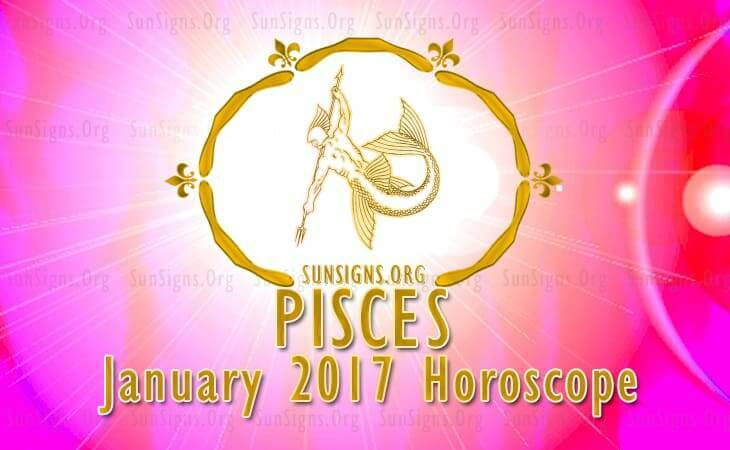 Pisces January 2017 Horoscope predicts that planetary aspects for career are favorable this month. Hence career and professional matters dominate over domestic concerns for Pisces born individuals during the month of January 2017. Your career objectives are encouraged by the family. Social activities and spirituality will occupy the attention of Pisces zodiac sign during the month of January 2017. You will focus on increasing your visibility in social circles by making new friends and by becoming a member of social organizations. You will actively participate in the various social functions in January 2017. Spirituality will be in focus during the month for the Pisces personality. You will be interested in attending spiritual gatherings or in spending your time in a spiritual sanctuary to enhance your emotional quotient. You will also be interested in spreading spirituality by teaching in January 2017. Pisces, you should be careful not to forget your worldly ambitions which are essential for existence while you are searching for mystical peace. The horoscope 2017 predictions for the Pisces zodiac sign foretells that career will be highly successful. This will be a source of your financial accomplishment in January 2017. The January 2017 Pisces horoscope also forecasts that finances will be complicated. All investments should be made after proper analysis and with due caution. You will gain financially by helping your spouse or partner to succeed financially. This is the right time to clear your loans with your surplus finances. Any tendency to borrow money for investing should be curbed. Pisces, you can expect unexpected money throughout the month of January 2017 periodically. You will have the overall support of family members and friends in improving your monetary situation in the month January 2017. You will donate money for charitable causes and your wealth is multiplied by donating money to others. The January 2017 monthly predictions for the Pisces star sign forecasts that plenty of romantic opportunities exist because of your social connections. You should allow love to blossom gradually and avoid any haste in getting into a committed relationship. Love is to be found at the workplace or in social gatherings. Singles should be careful not to date a loser. Existing Pisces relationships and marriages will either flourish or break in January 2017. Period after the Mercury Retrograde in 2017 is favorable for relationships. Pregnancy too should be planned after that. Health will be excellent throughout the month of January 2017 for the Pisces personality. Ailments like the common cold and loss of appetite should be handled with care. The Pisces January 2017 horoscope suggests that though work will be hectic, you should try to spend some time with your family as well.